This is a pair of new (non assembled) replacement deluxe rear interior trim panels for use on 1967 Camaro with deluxe interior and HARD TOP models only. 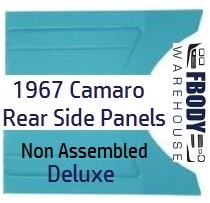 Replacing these panels in your 67 Camaro hardtop improves both the VALUE and also more importantly the looks of your interior as a whole! Dielectrically Sealed Stitch Line Bars.